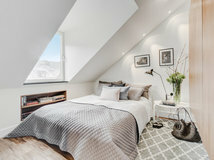 How Can I Make My Loft Conversion Feel Bigger? 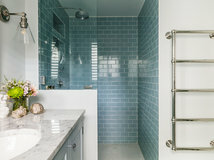 UK based Houzz contributor and freelance property and interiors journalist with experience in both the regional press and national magazines. I've picked up loads of tips from homeowners and experts alike, having visited hundreds of gorgeous real homes across the North of England. 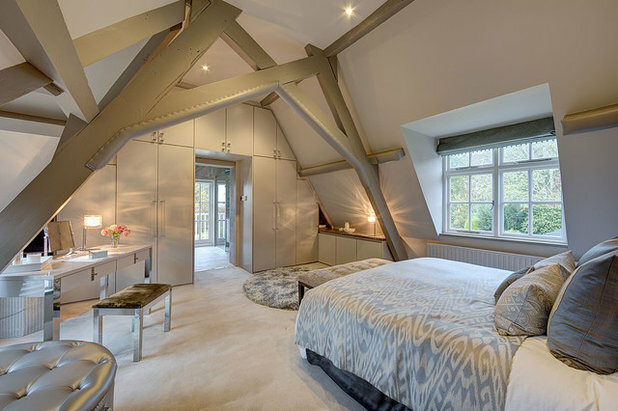 Converting a loft is a brilliant way to create an extra bedroom and add value to your home. 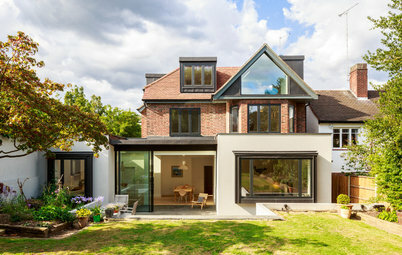 The key is to make the most of every inch by putting in some careful planning when it comes to storage and designing around the sloping roof and angled proportions. 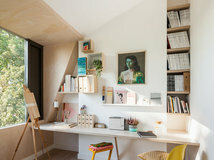 So whether you’re starting from scratch or want to retro-fit more hard-working storage into an existing loft, these clever tricks and well-planned spaces will give you plenty of food for thought. 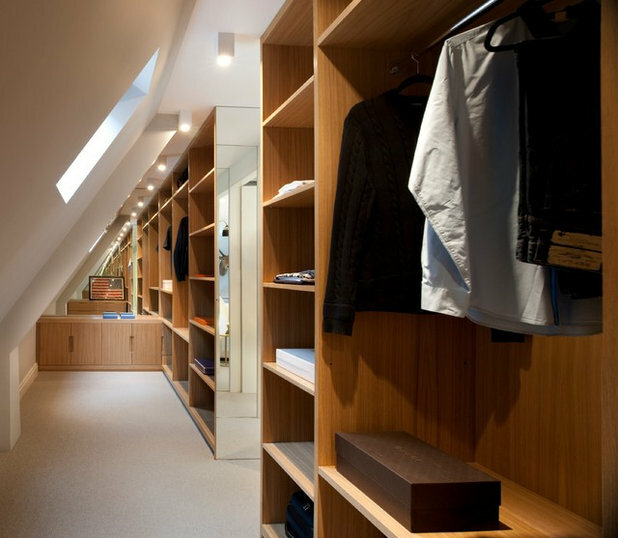 Made to measure is often the way to go when it comes to attic wardrobes. With sloping ceilings, dormer windows and skylights limiting your options, it’s often the gable end that has to be used for hanging clothes. Many people discount the wall around their entrance door, but they could be missing a trick here, as it enables the bed to be placed on the opposite wall. Get a carpenter to make the units for you, using every inch on either side and above the door, too. 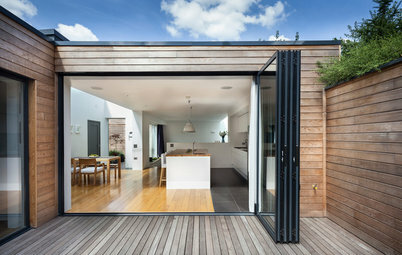 You could even fit sliding wardrobe doors right the way across to create a ‘secret’ entrance. 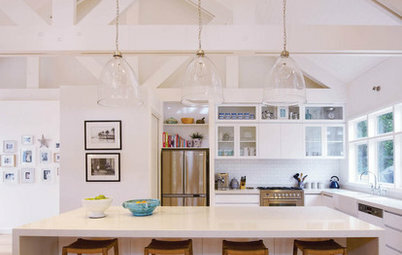 Using the dead space in the eaves for storage is a no-brainer. But before you simply opt for a straight run of cupboards, you might want to consider some alternatives such as this stepped design. 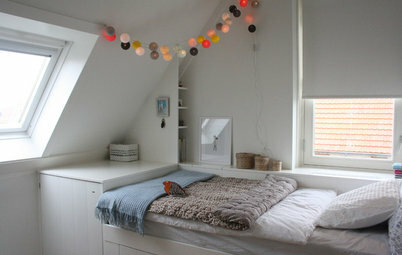 Not only does it look more interesting, but it also creates a ledge for accessories. 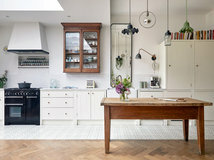 If your budget won’t stretch to bespoke, you might find that handleless kitchen units could do the job just as well. 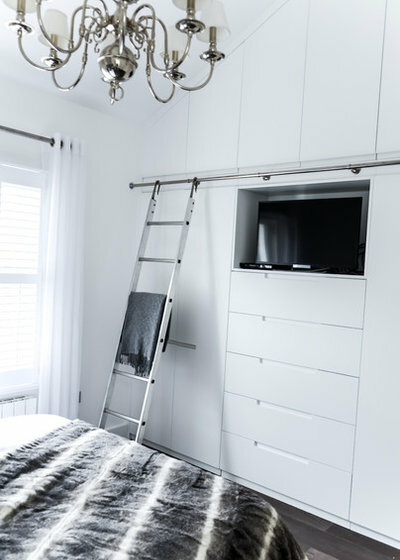 While maximising those sloping ceilings is a wise move, nobody wants to drag their ladder from the garage or haul a dining chair up the stairs every time they want to access a high cupboard. So plan your access from the start with a rolling library-style ladder system in metal or wood. 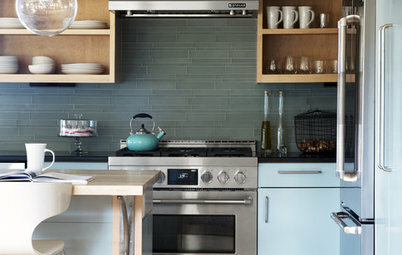 You could make it a feature by painting it a vibrant accent colour to suit your scheme. 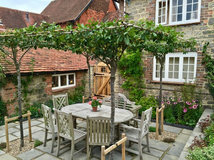 Another money-saving – and space-enhancing – option for eaves storage is to divide the area with posts and use pretty baskets, hampers, trunks or even vintage suitcases to stow away bits and pieces. Sturdy lidded cardboard boxes can be covered in wallpaper or wrapping paper, which has the added bonus of being changeable whenever you want to redecorate. Still at the planning stage? Then consider having a partition wall built on one side to create a discreet corridor for wardrobes. 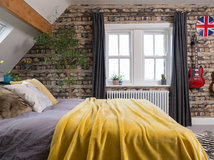 With a particularly large space, you could even do this on both sides of the room, effectively squaring off the sleeping area to make furnishing it a much easier task, as the bedhead and bedside tables can sit up against one of the walls. Or opt for back-to-back wardrobes, with one side open to the eaves and the other open to the bedroom. Another way to square off the room and make it easier to furnish is a central partition wall that has open access to the ‘hidden’ storage behind it from either side. 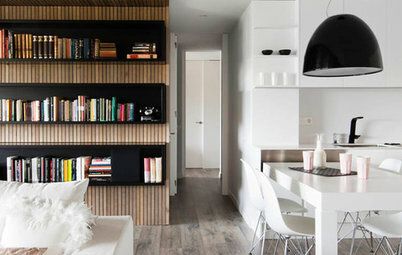 Although the room pictured doesn’t have sloping ceilings, you can see how the partition idea works. Its optimum position would depend on the dimensions of your room. 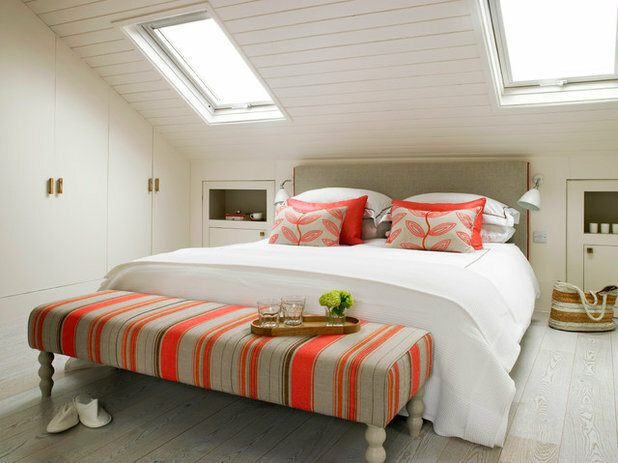 Make sure you measure the width of your bed and bedside tables to gauge the length of your partition wall. 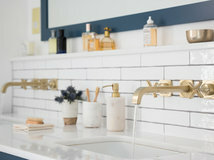 You can even make it a stylish feature by covering it with statement wallpaper, panelling or mosaics on all four sides. 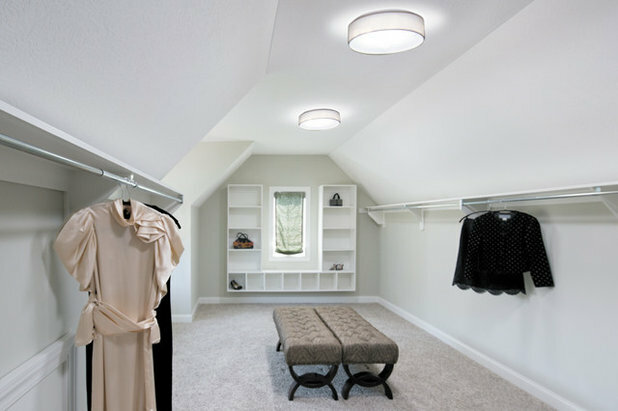 Find more walk-in wardrobe designs to help you inspire your project. Bedside cabinets with a recessed ledge above can be built into the eaves either side of the bedhead for a sleek, streamlined look. The only downside is that potential storage space behind the bed could be tricky to access, but this could be the ideal place for Christmas decorations that only come out once a year! 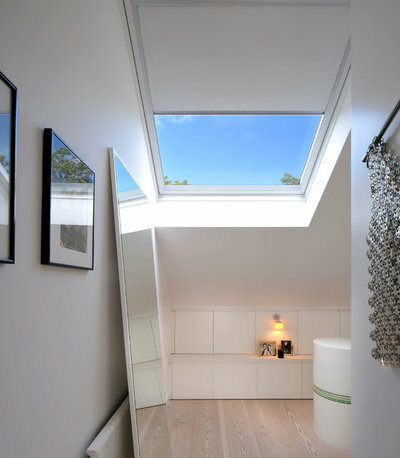 If you have a window at the side rather than just roof lights, this is the perfect opportunity to create a window seat with built-in storage. 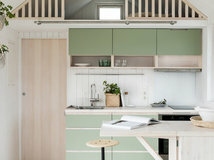 Not only will it make the most of the elevated views, but it’s ideal for storing spare linen or extra towels. 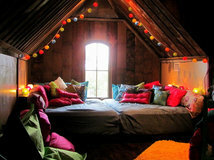 It’s easy to think that walls with windows must be left bare for fear of obscuring the light. However, adding storage here can work perfectly if the proportions are right. 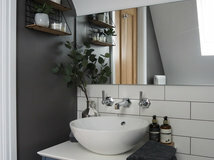 It’s best to ensure the storage doesn’t encroach too far into the room – as in these shallow shelves – and to paint it in the same colour as the walls. 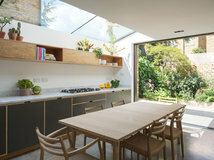 You can see that freestanding units on either side would have hemmed in the window pictured, but instead, the bespoke open box shelving fits snugly around it and works well with a simple blind. Sometimes the least obvious places offer the best solution. Starting from scratch with a new staircase to the loft is a great opportunity to include built-in drawers – ideal for smaller items. 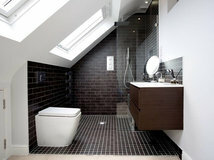 Talk to loft conversion specialists in your area to discuss your attic storage in more detail. 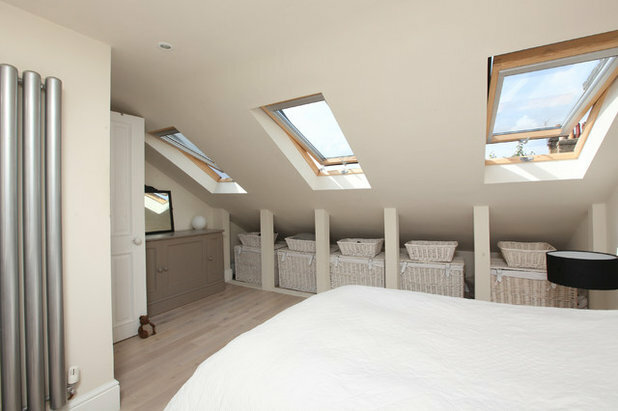 How have you tackled the storage problems in a loft conversion? Share your ideas in the Comments below. 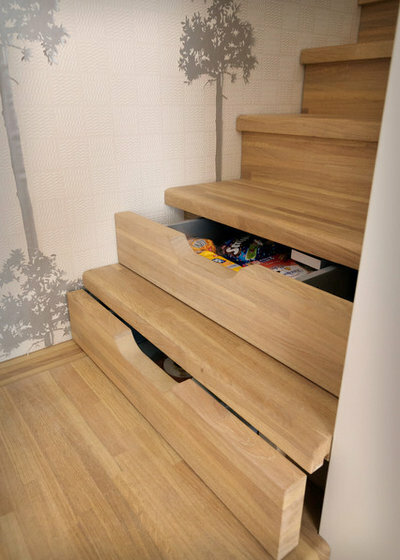 I love the storage under the staircase! 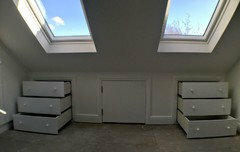 Loft Conversion eaves storage areas are very big. Made to measure cupboards are very handy as well. 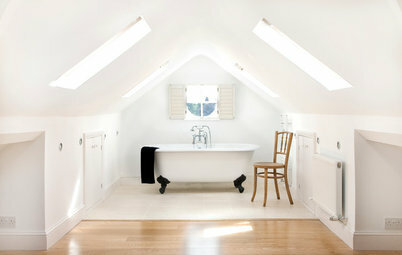 Each new Loft Conversion we build has masses of space and some of it is wasted if it isn't used properly. We find that the area between the frontal eaves and the stairs in almost all the Dormer Style Loft Conversions is mostly wasted space. 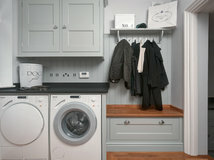 This is where we always advise our clients to install made to measure wardrobes as the space would otherwise be unused. 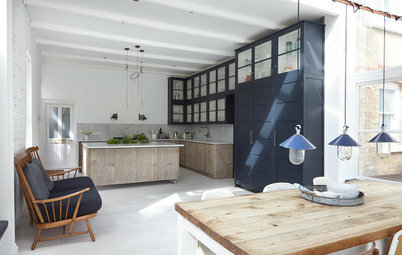 Some clients opt for cupboards across the entire wall opposite the stairs as well. The eaves areas should also be full boarded up at construction stage. There's a number of ways to make use of the eaves storage as Karen has pointed out above. 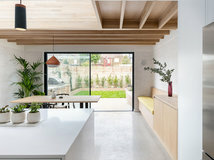 Another clever idea is to use boxed and wheeled storage systems which, in our experience makes use of every little inch of storage space within the eaves. This system is also handy for under stairs storage at ground floor level as well.